In March, South East London ACF and educational charity CVQO celebrated the achievements of a very special group of young people, at the headquarters of SE London ACF in Blackheath. 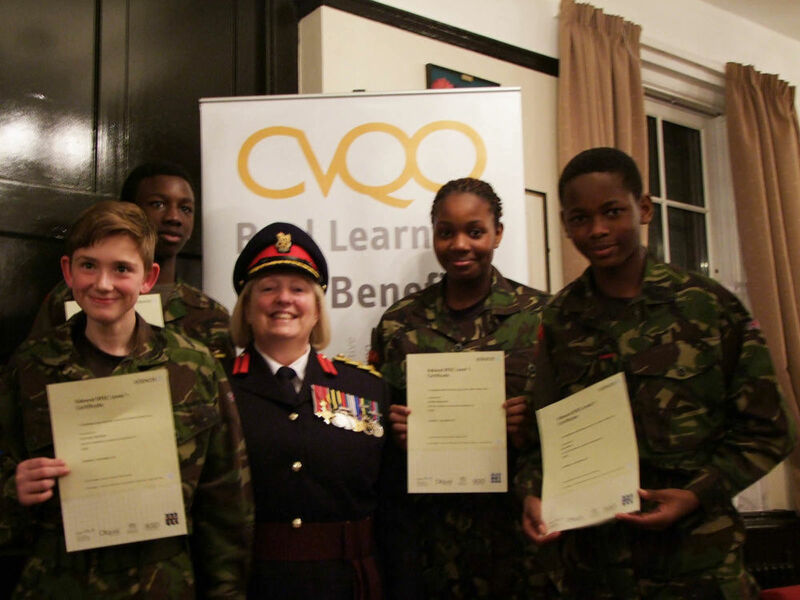 Cadets Esther Abidakun, 14, Ike Hayles, 13, Omatseye Kamal Less, 13, and Fletcher Morgan, 13, were presented with their CVQO led BTEC Level 1 Diplomas in Team Work and Personal Skills in front of family, friends and dignitaries, including Colonel Jane Davis OBE QVRMTDDL RGN, the Deputy Lieutenant of the London Borough of Lewisham, and representatives including local Councillors and senior members of local police stations. CVQO, with the generous sponsorship and support of The Worshipful Company of Ironmongers, offered a group of 60 young people from the Army Cadet Force (ACF), Air Training Corps (ATC) and Sea Cadet Corps (SCC) across London the chance to be the first to earn the BTEC Level 1 qualification for their cadet experience. This BTEC is one of a variety of new qualifications and awards offered by CVQO to members of the uniformed youth organisations, and the trial has proved highly successful.